Those of you that have followed this blog over the years know my preferred cost for a campsite is free. However, free campsites are not always conveniently located near the places I want to visit, so when I do pay for a space, I like a campground that offers real value for the dollar. Such is the case with the Fiddlers’ Campground operated by Xanterra Parks & Resorts in the heart of Death Valley National Park. 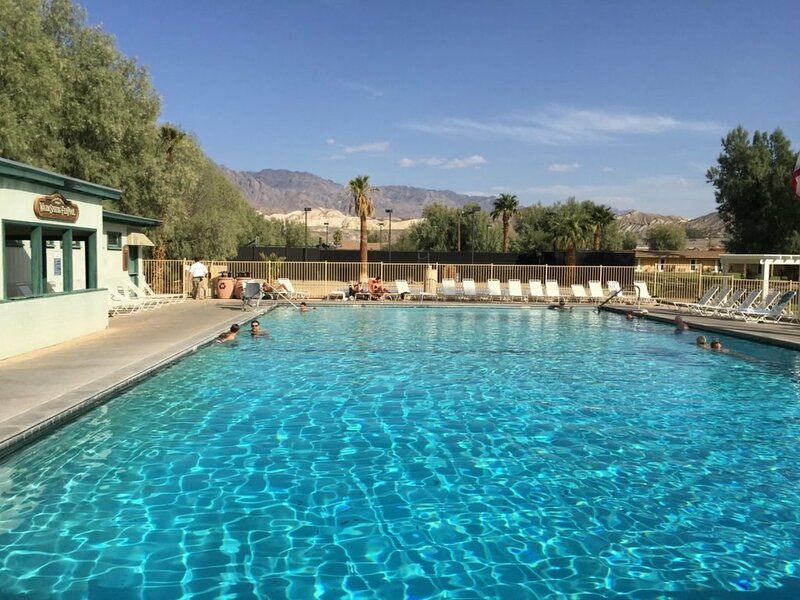 For just $18 per night, you get a campsite just a short walk from the National Park visitor’s center, near some of the park’s most iconic locations, and full guest privileges to the neighboring Oasis at Death Valley (formerly Furnace Creek Ranch) Resort. 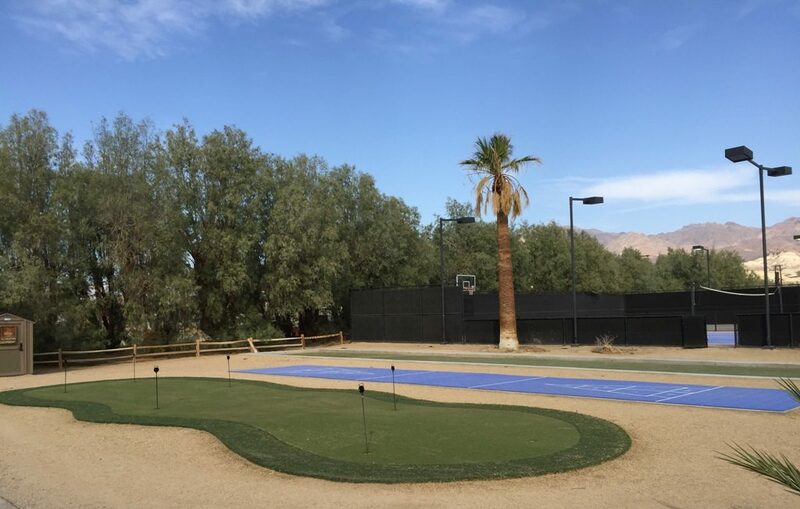 Some of the amenities available to campground guests include the resort’s natural spring-fed swimming pool, shower facility, coin-operated laundry, wireless internet, and sports courts including a tennis court, shuffleboard, volleyball, bocce ball, and basketball court. In fact, at $18 per night, you may want to treat yourself (golfer or not) to a meal at the 19th Hole where the burgers and view can’t be beaten! When booking a space, ask for a campsite along the south side where the shade trees are located. Quiet hours are 11 p.m. – 7 a.m., but generators may be run all night. 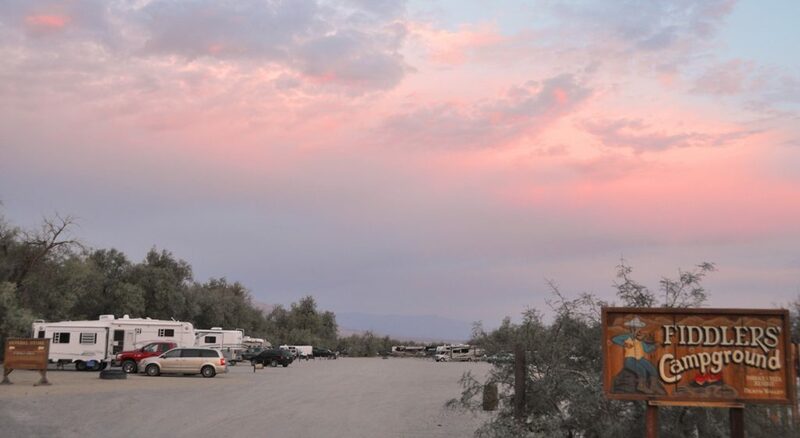 For more information on Fiddlers’ Campground, click here. Getting the most bang for the buck, just another adventure in RVing! No electricity in the campground??? Nope, that is why they allow generators to run round the clock. So, silly. They call it quiet hours and allow generators run all night. Not really. A/C is definitely needed in DV summers. The hum of generators is not as disruptive as late night parties, etc. Generator-free areas are available elsewhere. We only go to DV in the winter. Don’t need the a/c. Would much rather park across the street in the Sunset Campground for $7 (with senior pass) than take the chance of having to listen to generators all night. Better sunrise/sunset views too….. if you park in the right location/direction. Don’t need any of the resort amenities. Any services at Sunset CG?